Hawker Yard is bringing a Bank Holiday Weekend live music special to Birmingham, 25-27th August. Beginning with Blak Twang + Mr Thing and culminating with Hypnotic Brass Ensemble, the al-fresco eatery is celebrating the long weekend with a combination of dirty beats and delicious food. Birmingham’s first purpose built street food centre, Hawker Yard opened in 2016. Founded by Brum Yum Yum’s Duncan Stanley, the shipping container and scaffolding structure (somewhat dubiously described as ‘cargotecture’) aimed to bring some ramshackle permanence to Brum’s emerging street food scene. Styled with lanterns and lights, the formerly derelict yard now houses a variety of bar areas, lounging and eating options. The Pershore Road site was, however, put up for sale earlier this year as Stanley was seeking to relocate and recreate his East London vibe in, er, London. Now promoters Feel the Vibe and Hawker Yard LIVE have combined to devise a Bank Holiday Weekender to tempt the ears as well as the taste buds: renowned turntablist DJ Mr. Thing and British rapper Blak Twang kick off the weekender with a ‘till late party promising street dance performances and scratching aplenty. 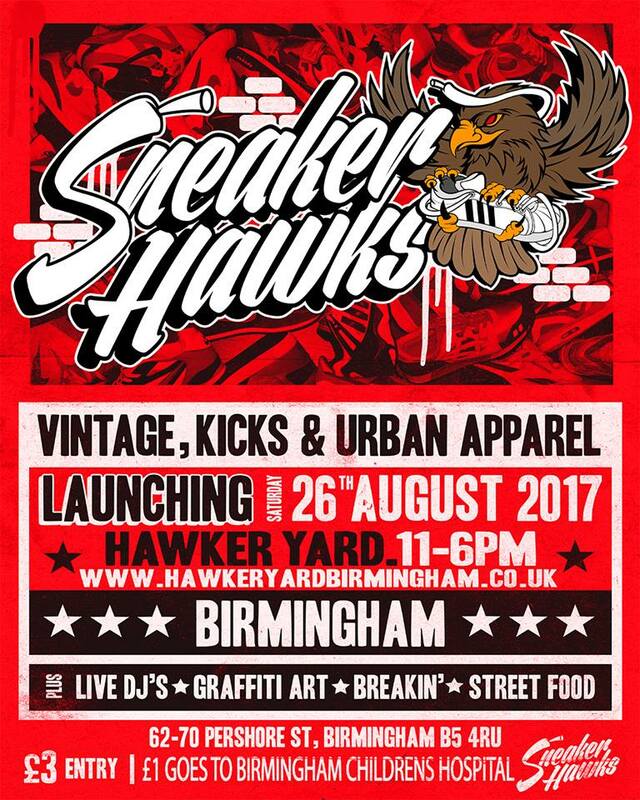 Saturday will see Sneaker Hawks launch the city’s newest ‘vintage, kicks and urban clothes’ event, with some of the £3 entry price supporting Birmingham Children’s Hospital. Non-shoppers wishing to indulge in some weekend philanthropy should appreciate the graffiti art, break dancing and fresh food, if not the ‘fresh garms’. Hypnotic Brass Ensemble, the seven sons of jazz trumpeter Phil Cohran, will round off the weekend. The group has real pedigree, having recorded and performed with the likes of MosDef, Wu Tang Clan, Prince, Childish Gambino, Maxwell, Erykah Badu, Gorillaz, and, of course, their father. No doubt their big eclectic sound, encompassing hip hop, jazz, funk and calypso will boom around Hawker Yard: the promoters promise a ‘bloc party vibe’ and the South Chicago band is likely to deliver with their delectable ‘hypnotic’ style. Birmingham Review last saw Hypnotic Brass Ensemble at The Glee Club back in June 2015, click here to read the BREVIEW from Helen Knott with pics from Ella Carman. For more on BLAK TWANG & DJ MR THING at Hawker Yard (Fri 25th), click here. For more on the Sneaker Hawks launch party at Hawker Yard (Sat 26th), click here. 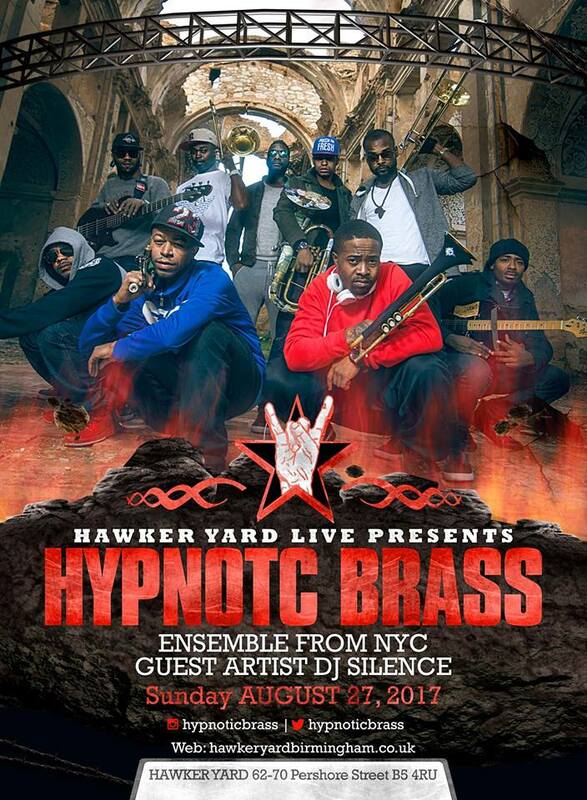 For more on the Hypnotic Brass Ensemble at Hawker Yard (Sun 27th), click here.